2011 was a year of change, domestic adjustments and some serious surprises from the most unlikely of sources. 2012 is going to be a year of mystery, intrigue and things happening behind closed doors, Aquarius. This is not to say that there is deception going on; it's just that some new issues, associations and friendships will prompt your curiosity, which in turn makes you more interested in doing your research when it comes to your career, love life and your family relationships as well. Know who you are dealing with, Aquarius. It will be of paramount importance that you are with the right people who make you feel better about yourself. Self-love will be the key to a new romance, improving an existing one and making solid plans for other areas that will come about quite suddenly. 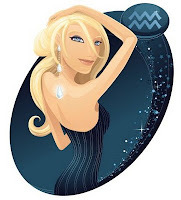 You should enjoy this transit, Aquarius, as you make new connections which are prestigious and advantageous to you in all areas. As 2012 opens, your ruling planet (Uranus) is now in the sign of Aries and your 2nd House of personal possessions and how you feel about them. This is an excellent time to become more introspective and ask yourself what you value most. The deeper you delve, the more you make progress and see the value in what REALLY does matter and it becomes more apparent how to be truly happy. This placement (Uranus in Aries) benefits you as it forms a beneficial angle to your Sun sign. Since Aries is in your House, you can expect to meet exciting new friends and some of them could travel in popular and prestigious circles. You could be mixing and mingling with like minded friends and will be excited at what develops. The other big news of 2012 is the planet Neptune and its entrance into Pisces from Aquarius in February. Neptune reveals what you cannot see clearly but what is blatantly obvious to those around you. Friends and family might not be telling you what they see but they will not see things as you do. There can be instances where this becomes glaringly apparent to you, Aquarius. Since Pisces rules your 2nd House, make sure you communicate in a way that others find soothing, not harsh. It will also be a time when you might not be looking at your finances and possessions realistically. This is a year to learn that money is not what life is about. Not like you don't already know this but it will be important for everyone to rethink our values at the end of the day, especially you, Aquarius, as this transit falls in how you view your money, resources and possessions. So get ready for a few surprises and shake ups where your views about materialism surface. You might have made money and lost it or recently inherited or acquired money in some manner. Either way, your ideas about money need to be re-examined and possibly reevaluated. Pluto (Change) has now been in your 12th House of isolation and you should have an idea of how powerful this planet is in your daily life. The 12th House is not quite as bad as its reputation. You can find amazing creativity in your life but you could also feel like staying in bed all day long, sleeping or taking medication for anxiety. Whatever the case may be, you have learned more about yourself and your fears and have faced them bravely. Areas such as therapy, your apprehensions and secrets will be addressed. You will be ready, willing and able to deal with these issues during this long transit. It's always a good idea for self-reflection and this transit might ask you to think about where you might have been wrong and make amends. If you have a strong desire to isolate yourself from the world, then therapy, hypnosis and meditation would be ideal areas to pursue as would yoga or taking on a new hobby. You might just find that your favorite hobby can be turned into an empire. You are a natural artist, so utilize those skills and see what develops. Good News Aquarius: The year opens with Jupiter in Taurus. Jupiter is where you will be the most expansive and prosperous. Jupiter is in your 4th House and you can find that your family life expands, changes in some way or that you're feeling better about your home life overall. The 4th House is also about the past, motherhood and endings so these can be lucky areas for you as well, Aquarius. When one door shuts, another one opens. Jupiter will be in your 4th House of family until 6/11, when it enters Gemini, your 5th House of romance, children and what like you do for fun. You will have luck and success through your family life and it will be an excellent time for you to expand in areas where you hope to achieve success. Jupiter will occupy Taurus (Family) until 6/11 and Gemini (Romance, fun, entertainment) for an entire year. Possibilities? The birth of a child, an unplanned pregnancy or falling madly in love with your partner again could be in your future. You could also find a dream home or meet the love of your life, if single. You will definitely see and feel the smiles that come with Jupiter, especially when it transits a sign like Gemini. Saturn (Cosmic cop) will also transit two signs this year. It has been in Libra since 10/09 and will enter Scorpio in October 10/12. Saturn in Libra is a compatible sign for you to have in this placement as it doesn't quite get to you in the way it would a water or earth sign. The beginning of 2012 is a BIG time for you to let others know where you stand, where you choose to live and with whom you want to live. The first 9 months of 2012 are very important for Aquarius to begin building a more solid foundation. Do this as Saturn transits Libra so that all systems are ready to go when Saturn enters Scorpio in October. With Saturn, you reap what you have sown essentially. The idea here is tough love. If you have played by the rules, worked hard in these areas and put in the overtime required, you will see a pay off. Conversely, if you have been taking short cuts and not trying to resolve domestic situations and family affairs than you might be asked to do it all over again. The signs of Virgo and Pisces can introduce you to a new world of friends, experiences and surprises. You will bond closer with both of these already close signs in 2012. A Virgo seeks your assistance while a Pisces will inspire you on some level.